Here is the fifth sauce. This is one of my favorites of the night. 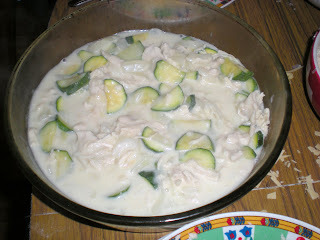 This involves using chicken and zucchini cooked in a buttery white sauce. 1. In a large pot, heat oil over medium-high heat. Cook chicken and add a bit of water along the process to prevent from browning. Cook until all white. Remove from heat and shred chicken with two forks. Reserve. 2. Cook zucchini until soften and reserve with chicken. 3. In the same pot, melt butter over medium heat. Cook onion until transparent. 5. Slowly pour in milk, stirring constantly. 6. Simmer until it thickens. Incorporate in the chicken and zucchini and let it cook for 1-2 mins until warm. Season with salt and pepper to taste.